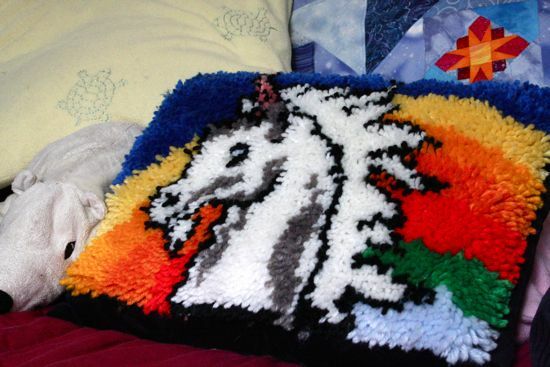 Sometime when I was in elementary school (I think), I received a latch-hook rug kit as a gift, probably from my grandparents. It's a unicorn with a rainbow background, and it's oh-so-80s. Like many of the projects I worked on then, I liked doing the details, changing colors frequently and filling in small spaces. When it was time to do the background, interest flagged. The project was tucked away and forgotten. It resurfaced sometime after Caitlyn was born, discovered during one of Mom's excavation projects. She finished that neglected background and brought it up to us, and I tucked it away under my work table. But this time, I didn't forget about it! And yesterday evening, I handed Caitlyn a completed pillow, made from extra curtain fabric, latch-hook unicorn on the front, and stuffed with fabric scraps. It's heavy (due to the fabric scrap stuffing) and scratchy, but Caitlyn rearranged her bed so that she could sleep on this newest addition. After probably, 25 years, this project is finally finished!